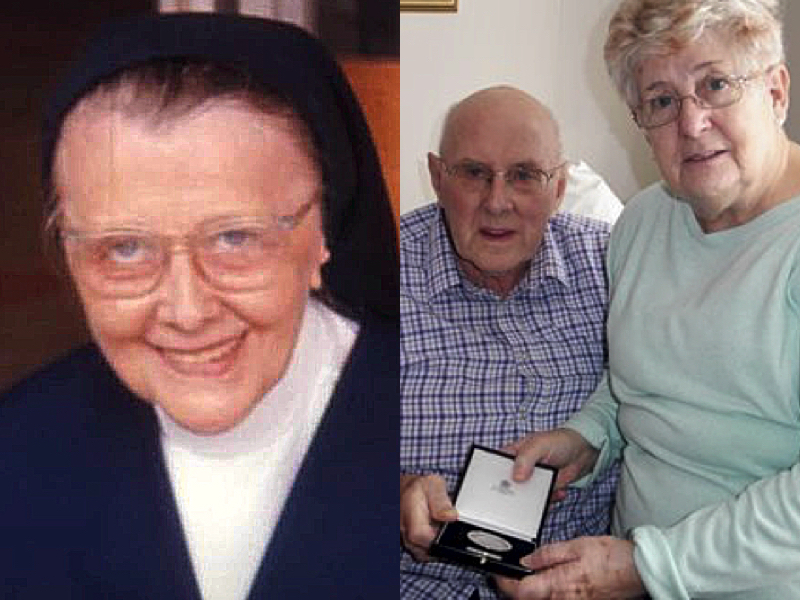 Left: ‘Aunty Ada’, Sister Agnes Walsh. Right: Peter and Mercia Judson holding the Hero of the Holocaust medal that ‘Aunty Ada’ was awarded by Prime Minister Gordon Brown. Local writer Ian Judson has submitted this fascinating account of his Great Aunt, a local Holocaust heroine. The end of January every year has a very dark shadow hanging over it, as we remember the countless victims of the holocaust. But right here in Hull, we have a shining beacon to look up to at this time of year. First let me explain, I have a personal connection to this story, because the lady in question, who passed away in 1993, was my Great Aunt Ada, you will come to know her better as Sister Agnes Walsh. Born in March 1896, at Brunswick Villas, Ada Valinda Walsh worked for the council in her early adulthood, until in 1916 she answered the calling of God, to become a nun, then being shipped across to Ireland, which is a very important part of this story, to take the holy orders. In 1932 Sister Agnes went on a mission to Jerusalem, where she spent three years. By a twist of fate, she had been given an Irish Passport so she could travel to Jerusalem. In 1934 she had an unfortunate accident – falling down some steps and injuring her back. She was first treated for her injuries at hospital in Bethlehem, but in 1935 she was transferred to France for further medical treatment. She stayed in France, in Andernos and Paris until 1940, before being appointed Assistant in Cadouin, the Dordogne, South West France. At the convent they ran a school for girls aged ten to 14, Sister Granier was the superior. The school had 12 sisters and between 30 to 50 students and staff. Sister Agnes soon settled in, teaching art in the school, and receiving Red Cross packages, due to her Irish Passport, which helped keep the school going. In 1944, a Jewish man called M. Pierre Cremieux, who had met Sister Agnes some years earlier, arrived at the convent with his wife, and their three children, seven year old Alain and nine month old twins Colette and Jean-Pierre, and pleaded for a safe place to stay. At the time the Germans were rounding-up Jews in huge numbers, and Sister Agnes convinced Sister Granier to agree to house them there. Because of her Irish Passport, any Germans who dealt with her were convinced of her heritage and, because Ireland was a neutral nation, she was considered to be no threat, not worthy of German interference. If they had ever found out the truth about her English nationality she would have been under far greater scrutiny. If her Jewish friends were ever discovered she would have been shot. Sister Agnes took the family under her wing, until a phone call warned her that her “Friends from Paris” had better not be at the convent when the Germans came for an inspection. Immediately the family were smuggled away to Villeneuve-sur-lot, where they remained hidden until they fled to America. In 1990, my 94 year old Aunty Ada was named as a Righteous Gentile, placed on the list of the Righteous Among the Nations and had her name carved in the wall at the Garden of the Righteous at Yad Vashem. In 2010, then Prime Minister Gordon Brown awarded her the ‘Hero of the Holocaust’ medal, at a special event in Downing Street, two Daughters of Charity accepted this commendation on her behalf. In January 2017 this daughter of Hull was finally remembered in her hometown, with a centenary cream plaque, instituted by former Lord Mayor Mary Glew. Be the first to comment on "Hull’s Holocaust heroine"